Chinua Achebe, the author of Things Fall Apart, is a writer whose moral courage and storytelling gifts have left an enduring stamp on world literature. There Was a Country is his long-awaited account of coming of age during the defining experienced of his life: the Nigerian Civil War, also known as the Biafran War of 1967 - 1970. It became infamous around the world for its impact on the Biafrans, who were starved to death by the Nigerian government in one of the twentieth century's greatest humanitarian disasters. Caught up in the atrocities were Chinua Achebe and his young family. Achebe, already a world-renowed novelist, served his Biafran homeland as a roving cultural ambassador, witnessing the war's full horror first-hand. Immediately after the war, he took an academic post in the United States, and for over forty years he has maintained a considered silence on those terrible years, addressing them only obliquely through his poetry. Now, years in the making, comes his towering reckoning with one of modern Africa's most fateful experiences, both as he lived it and he has now come to understand it. Marrying history and memoir, with the author's poetry woven throughout, There Was a Country is a distillation of vivid observation and considered research and reflection. It relates Nigeria's birth pangs in the context of Achebe's own development as a man and a writer, and examines the role of the artist in times of war. I only read Things Fall Apart and No Longer at Ease for the first time earlier this year (I know, terrible), and it was only after reading them that I finally understood why Chinua Achebe is the legend that he is. So I'm pretty excited about There Was a Country and I'm really looking forward to reading it. Same here. I can't wait. 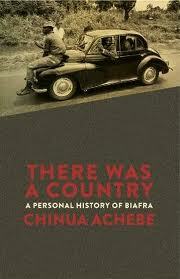 It also will be really nice to read his accounts of the Biafran War.